This Gigantic picturesque dam is located about 3 km from the town of Wonogiri. The water supply of the dam is from Bengawan Solo River, the longest river in Java. Its construction was in 1975 until 1981. 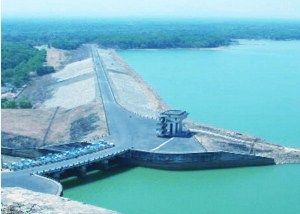 The lake of the dam covers an area of 8.800 ha and has capacity to irrigate 23.600 ha of rice fields in the regencies of Klaten, Sukoharjo, Karanganyar and Sragen. It supplies the drinking water for Wonogiri and electrical turbine with capacity of 12,4 M.W. This is also a beautiful place for water recreation. There is a pier for boots to take people around the lake and also available facilities for water skiing, fishing and floating restaurant. The hand-gliding sport can be enjoyed here. There, we can find Sendang recreation park that located at the bank of Gajah Mungkur dam, about 6 km from the town center of Wonogiri town to the South. The visitor can enjoy boating, fishing, water skiing, swimming or engage in hang gliding sport which starts from a hill near the dam.